Zakk Pamajewon is a member of the Wasauksing First Nation. He graduated from Parry Sound High School in 2009 with interests in travelling and renewable energies and enrolled at St. Lawrence College in Kingston, ON, in the Wind Turbine Technician – Industrial Electrician Co-operative Apprenticeship Program in September 2010. In April 2012, Zakk successfully graduated from the program and is now a Registered Apprentice with the Ministry of Training Colleges and Universities as an Industrial Electrician and is seeking his internationally recognized Red Seal certificate. Having relocated to pursue an education, he initially found the transition challenging but found support through family and the Aboriginal Support Centre at St. Lawrence College. Zakk realized after graduation securing employment within his industry was difficult but he persevered and was offered a job in Northern Ontario based on his qualifications. As in many in-demand industries, having found a potential employer required specialized training and Zakk sought assistance from Gezhtoojig Employment and Training. Zakk was provided assistance under Employment Support and Mobility to specialize in Fall/Arrest Rescue from Heights and OHSA 10-Construction Awareness. 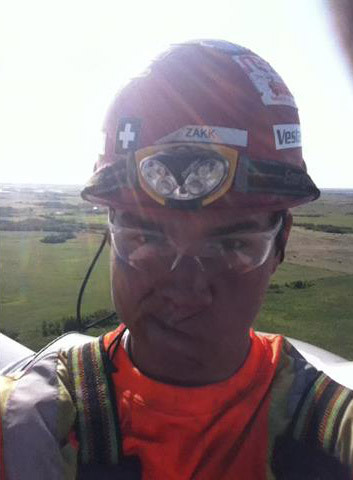 Currently, Zakk is in southern Ontario working within his industry as a Travelling Wind Turbine Technician. Zakk would like to give thanks to his mother and brothers and the Aboriginal Centre at St. Lawrence College for their support in his educational aspirations. Moreover, Zakk would like to thank his employers, and Gezhtoojig Employment and Training for their financial assistance that ensured he was prepared for first time employment in Northern Ontario and Alberta.